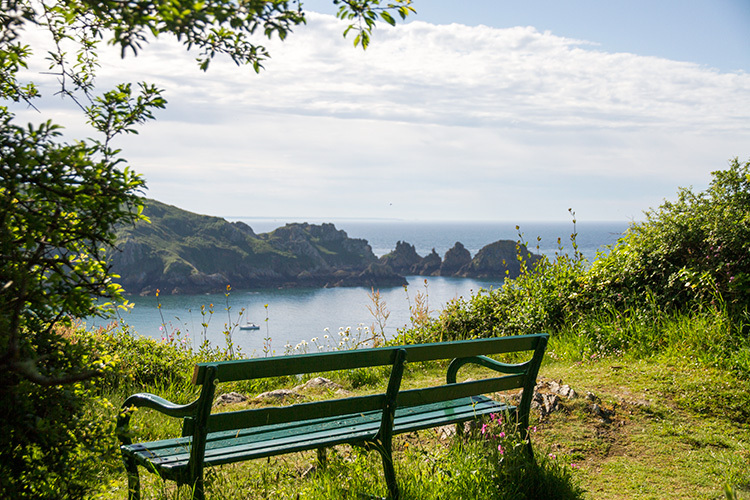 Walking the coast path along Guernsey’s south coast cliffs is a wonderful way to spend a late winter or early spring day. The views are spectacular and the walking is challenging enough to ensure that you’ll thoroughly deserve dinner and a few drinks by the fire at the Bella upon your return, with some easier inland route options available for the return leg should you so wish. This walk heads west from the Bella Luce to nearby Petit Bot Bay, with the option to retrace your steps back along the coast path or to create a circular route to bring you back to the Bella. 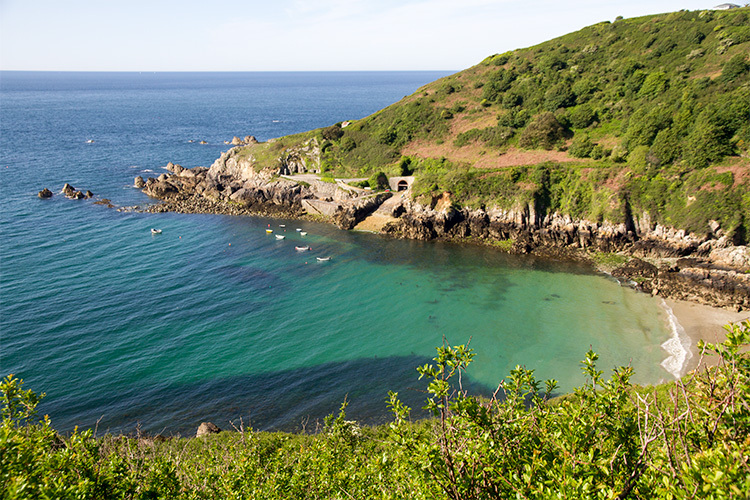 Distance: Approximately 6.5 miles (coast path there and back) or 5.1 miles as a circular walk. Terrain: Coast path - hilly, with some steep steps. Circular return route on paved lanes and roads. If you leave reception into our front (gravel) car park, turn left out of the gate onto La Fosse de Bas and follow the road downhill, following the stream on your left-side, all the way to the small car park above Moulin Huet. Just before this car park a path slopes off up to the right and you can either take this (flatter) path, or continue on down the hill to the tea rooms and then turn right at the Renoir sign and climb the steps up to the coast path signposted Saints Bay – Icart Point. Turn left at both junctions as you climb the steps and when you reach the flat path at the top, set off along the coast path towards Saints Bay keeping the sea on your left. When you round the corner above Saints Bay descend the new steps to the left down towards the beach where there is a seasonal kiosk and public toilets. From here you climb the new path behind the toilets, up past the loophole (Martello) tower to meet the harbour road where you can either walk to the end where there is a flight of steps to the coast path on top of the headland (the views are fantastic, but there are 304 steps so you may wish to take the slightly easier alternative), or turn right and head up the road slightly to a path that doubles back towards the headland at a much gentler gradient. From the headland follow the coast path along the top of the cliff until you round Icart Point and get a view across Petit Bot Bay. Continue past Icart Point car park and the facilities here, and head west along the coast path past the turning down to La Jaonnet Bay. 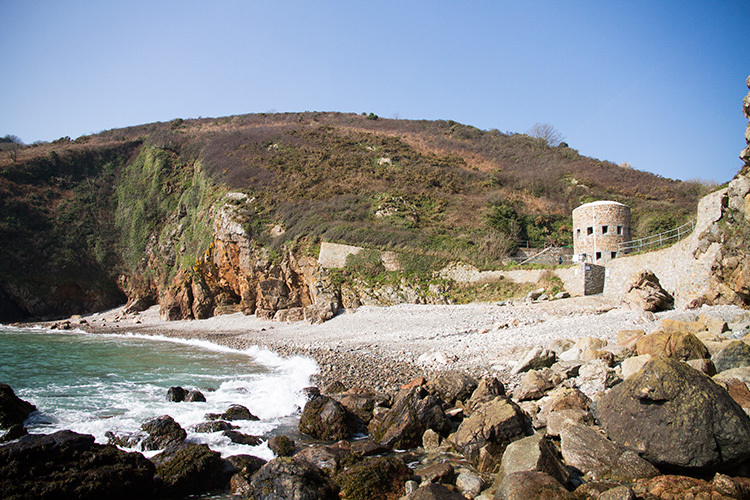 After crossing a small valley the path bends inland and meets the lane that heads down to Petit Bot Bay, where there is a beach, loophole tower (open to visitors between March and October) and seasonal tearooms and public toilets. From Petit Bot Bay you can either retrace your steps along the coast path, or take an inland route to make a circular walk back to the Bella Luce. If you’d like to make it a circular walk then walk back up Rue des Croise, past where you joined it from the coast path and on up the valley until it turns sharp right and becomes Rue des Pages. At the end of this lane turn right, left at the fork shortly after, and then carry straight on along Longtrac walking with the houses on your left and the fields that run down to the cliffs on your right. Where Longtrac meets Rue des Marettes (there are a number of large glasshouses opposite the junction) turn right and follow the lane until you get to Icart Road. Turn left and walk inland along Icart Road. The road turns right and then meets Saints Bay Road. Turn right, then immediately left, to cross Saints Bay Road and walk along La Motte. At the end of La Motte (on the corner of Les Douvres Hotel) you can either turn left and follow the road back to the Bella Luce, or you can take a slightly longer route back by taking the right turn. If you choose the latter then after the left bend continue straight and eventually follow the lane around to the left, which will bring you out at the small crossroads by the postbox just below the Bella Luce. Turn left here and you can follow the lane a short distance uphill retracing your earlier footsteps back to your start point.